Sql Code Re-Use. A worked example. One of the most popular good-programming practices is that code should not be repeated. You may have heard this referred to as DRY (Don’t Repeat Yourself). The idea behind this principle is that in the event of future revisions, such as: bugs, rethinks or shifting requirements, changes need only be made in one place. This prevents possible inconsistency between different parts of the application which implement similar logic. The codebase is kept as small as possible, making it easier to maintain. That’s always a great idea in a modern, structured language. In T-SQL however, we have to be very careful, as code re-use is notoriously difficult to achieve without falling into the pitfalls that can significantly adversely affect performance. This article attempts to address some of those pitfalls, providing a working solution. This is done in a SQL Server 2008 environment using table valued functions. Assumed knowledge: Scalar functions are bad. Multi-statement table functions are bad. Nesting stored-procedures doesn’t work. Outputting stored-procedure results into temp tables can be unnecessary overhead. Ability to read basic execution plans. The example uses the data structures needed to track a football league (no not american football). Hopefully, a familiar topic will mean that everyone to know what’s going on without any introduction. If you’re familiar with my earlier articles, then the same database is used here as well. If not, then you can use this script to create the database and this one to populate it with data. It is not necessary to have the database to follow the article. 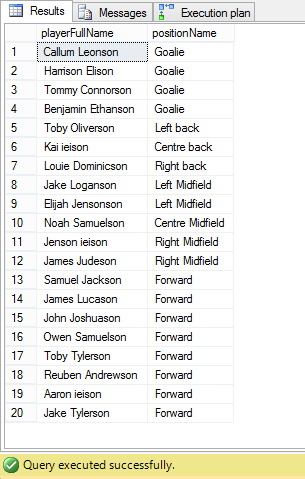 The players in a team varies over time, so the following query returns player information for a given team at a given time. Let’s call this the Squad query. The next query returns the goals and players who scored them on a given date, for the same team on the same date. Let’s call this the Score query. 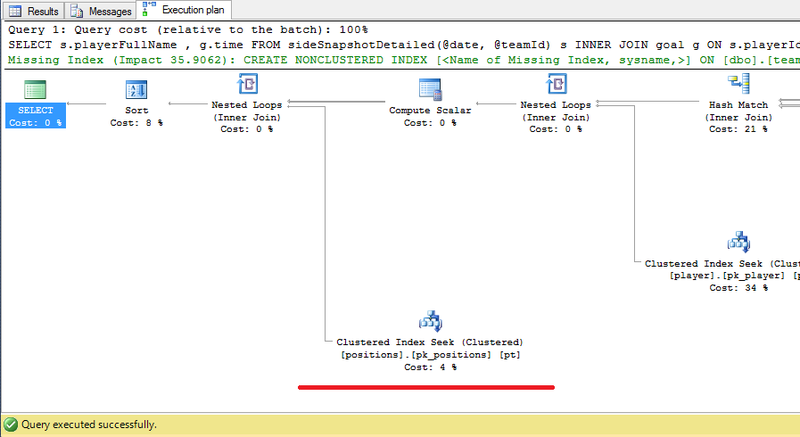 Notice that both queries contain the same complex WHERE clause on the teams_player table. According to the DRY principle we should try to factor out this logic so that it is only in one place. This can be done using the table-valued function shown below. I have not included the results sets or execution plans but I can assure you they are identical. Now, any future changes to how the teams_players table is queried is can be made in one place only; the DRY principle has been applied and our codebase is healthier for it. So even if the function returns more information than is needed, the optimiser will optimise the query at execution time and not perform any additional work? No. Once again the result sets are identical, as is the execution plan for the Squad query. However, upon inspecting the execution plan for the Score query you can see that a join is being made to the positions table even though no information from this table is used. There is a foreign key constraint on the positionId column as well so joining will not restrict the result set. 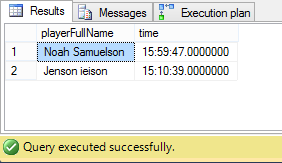 This is one of the pitfalls that we must look out for while implementing code re-use in Sql Server. Although table-valued functions allow us to easily re-use our code, we must be aware that the optimiser is not fool-proof, complicated queries can result in inefficiencies. Code re-use needs to be kept simple in order not to confuse the optimiser. We can implement the DRY principle safely in this case, but we need to split the function up into smaller pieces. Below we create a new function which only applies the name manipulation logic and cross apply to it. We have not reduced the number of lines in the query, but that was not the object of the DRY principle, the important point is that all the complex logic is now done in one place. The DRY principle can be safely implemented in Sql Server T-SQL, with the help of table valued functions, but in order to do so you must be careful and follow some rules. Although this article only covers one specific example, the following are general rules that should be adherred to. Don’t attempt to use table valued functions to provide denormalised views of your data. Each function should perform a single task (single responsibility principle). Only use functions to re-use complex logic. Using the function should be less complicated than the logic it contains! Personally, I would only use a table valued function to perform a join where the join logic is complex or non-intuitive. I use them more frequently in examples like nameConverter, where business logic needs to be applied in multiple places across the database. Database Deployment. Hacking the VS database project. Part 2. Database Deployment. Hacking the VS database project. Part 1.